Join the NeoVictoria Roleplay Group tonight in AuroraFF SIM as we roleplay our search for the groom. The roleplay begins tonight, Tuesday, 28 April 2015, at 6 PM SL-Time! The young newspaper boy automaton stands on the cold cobblestones in the early morning fog, hawking his wares in a hollow metallic tone. The votes were counted and it was time to toast the winners of the photo contest. Xi spun fabulous tunes and Asil showered the winners with Lindens and love. Plus, all who attended received a souvenir 2015 calendar featuring the winning photos. “Wolf Up Top” by Lazy8 was the winner! “Markus, Ready To Fight” by Lazy8 took second place. “Market Thieves” by RedShirtedAgain took third place. “Worship” by Myomy took fourth place. “Phantom” by Jarricard Barineaux took fifth place. “NeoLondon from Machinima” by La Baroque took sixth place. “NeoVictoria Circus” by La Baroque took seventh place . “View from the Market” by Lookatmy Back took eighth place. “Research Time” by LookAtMy Back took ninth place. “Watcher” by Valentine Adler took tenth place. “Ginger” by Xiuhcohtl Balazic took eleventh place. “Lucinda” by Rowenamharper took twelfth place. with “Guardians” by Val Adler, “Apparition” by Jarricard and “Warm Interior” by Rowena Harper making it to the semi-finals. Congratulations to everyone who participated. It was a great showing! The NeoVictoria Project presents the 2014 Photo Contest Award Party! “Markus, Ready To Fight” by Lazy8 took second place in the 2014 NeoVictoria Photo Contest. “Worship” by Myomy took third place in the 2014 NeoVictoria Photo Contest. “Market Thieves” by RedShirtedAgain took fourth place in the 2014 NeoVictoria Photo Contest. “Phantom” by Jarricard Barineaux took fifth place in the 2014 NeoVictoria Photo Contest. 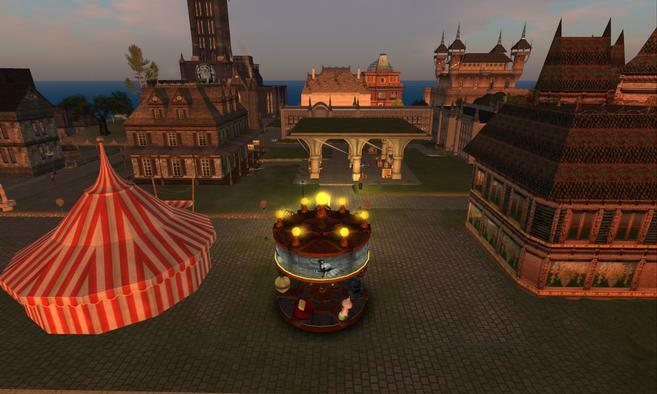 “NeoVictoria Circus” by La Baroque took seventh place in the 2014 NeoVictoria Photo Contest. “View from the Market” by Lookatmy Back took 8th place in the 2014 NeoVictoria Photo Contest. “Research Time” by LookAtMy Back took ninth place in the 2014 NeoVictoria Photo Contest. “Watcher” by Valentine Adler took tenth place in the 2014 NeoVictoria Photo Contest. “Ginger” by Xiuhcohtl Balazic took eleventh place in the 2014 NeoVictoria Photo Contest. “Lucinda” by Rowenamharper took twelfth place in the 2014 NeoVictoria Photo Contest. And we’re having a party in the NeoVictoria Skyclub to celebrate the excellent work and the folks who did it! Live DJ Xiuhcohtl Balazic will be spinning tunes and there will be a very special souvenir given to all the folks who attend. Ran the entire month of December. 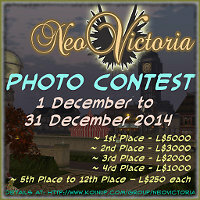 To read the official rules, visit the NeoVictoria 2014 Photo Contest discussion in our Koin-Up group. 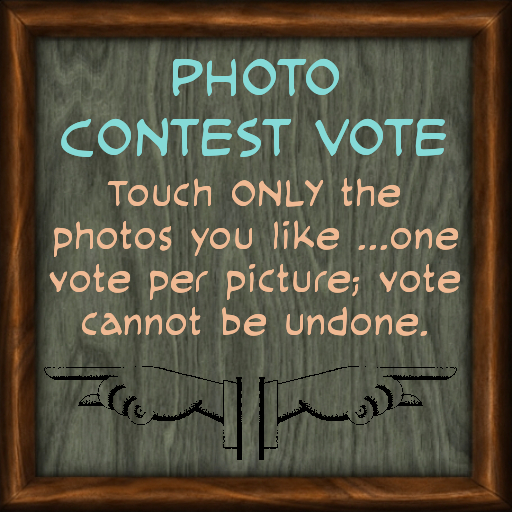 The NeoVictoria 2014 Photo Contest Wants Your Vote! Visit the SkyClub in Machinima SIM to cast your Vote! The top fifteen images from our community web-vote (below) are now staged in-world and ready to receive your vote. The main criteria was the image was related to our storyworld and was captured on the land level of the Machinima SIM or the NeoVictoria SIM in Second Life last December. Contest ran the entire month of December.